Home / -Preview- / Moody Blues / Preview / Moody Blues Assemble 50th Anniversary Edition of "Days of Future Passed"
Moody Blues Assemble 50th Anniversary Edition of "Days of Future Passed"
On November 10, 1967, the Moody Blues released their second album and the first with a new lineup that pushed the boundaries of rock music and blurred them with classical. Based on a stage show concept the band had created, they went into the studio with Peter Knight and the London Festival Orchestra to record the high concept album that saw multi-movement sections representing different parts of the day. 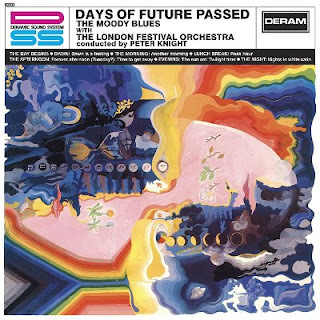 While many consider the album a pioneering effort in the development of progressive rock, it is also seen as one of the first to combine rock with an orchestra although, in reality, the London Festival Orchestra only plays during the last section of "Nights in White Satin". The album went to 27 in the U.K. and an amazing 3 in the U.S. considering that it didn't really spawn any hit singles, at least at first. "Nights in White Satin" went to 19 in the U.K. and didn't chart in the U.S. when released in 1967 and the followup, "Tuesday Afternoon" hit the Billboard Hot 100 at 24; however, when it was rereleased in 1972, it became a worldwide hit going to 2 in the U.S. (number 1 on Cashbox), 9 in the U.K., 8 in Australia and 1 in Canada. On November 17, a week after the album's 50th anniversary, a new 2-CD/DVD edition of the album will be released via UMC. This 2CD/DVD deluxe set includes the full original 1967 stereo mix, which is being released on CD here for the first time. Due to a damaged master tape of the original mix, the album had been remixed in stereo in 1972 and since then it is this later mix, which has been used on all CD reissues. Now that technology allows for the original master to be repaired, the album can be fully represented on CD 1 of the set for the first time as well as on the 180gm vinyl. The vinyl version also contains a download code. This new set also includes a 5.1 surround sound mix derived from the original 1972 Quad mix. Additionally the DVD comprises previously unreleased video footage of the band performing three key tracks from the album at MIDEM on January 24, 1968, eight weeks after its release. The 2CD/DVD set includes a poster designed by Ray Thomas. The Moody Blues were nominated earlier today for induction into the Rock and Roll Hall of Fame. About (blank) time. This is the holy grail for the die hard Moodies fans, who have wore through their original vinyl copy years ago. Finally get (hopefully) a clean complete copy of "Time To Get Away" with the original double tracked chorus, Original Mellotron instrumentation in Dawning Is The Day and punchier tempo of Twilight Time.